Move water quickly + easily. Ideal for watering plants, grass + bushes, near or far from your spigot. Wash the dog! Fill the kiddie pool + bird bath. We love the water cart! It's been great! The new patent pending Smart Water Cart Plus is the easiest, most convenient and most innovative way to carry and dispense water. 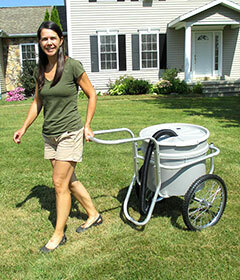 The water weight is perfectly balanced to transfer the load to the wheels significantly reducing the effort to carry up to 20 gallons of water. 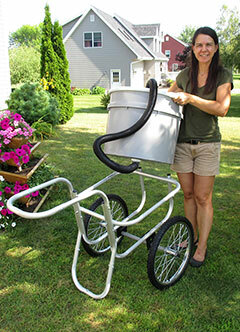 No more buckets to carry, no more long hose to handle. The Smart Water Cart Plus is also equipped with a flexible crush-resistant and virtually kink-proof hose to easily reach the desired areas. 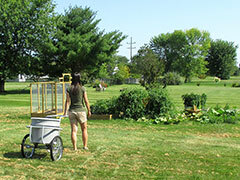 The hose is attached to the cart for ease of handling. It also comes with different quick connect flow tips to easily switch from an heavy flow pattern used to quickly fill a bucket to a gentle spray shower pattern ideal to water delicate flowers. As with all Smart Carts products, it is manufactured in the USA following strict specifications to ensure optimum quality and durability. It also comes with a life time warranty on the frame. Save time and energy to bring water to your horses, garden or trees. The system naturally dispenses water relying on gravity. No need for a pump or complex system than can break. This product is made to last decades. 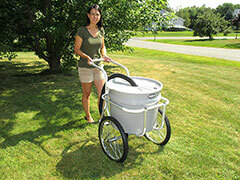 The Smart Water Cart Plus ships 90% assembled. You will be enjoying your Smart Water Cart within minutes.